The NBA All-Defensive Team is an annual National Basketball Association (NBA) honor given since the 1968–69 NBA season to the best defensive players during the regular season. The All-Defensive Team is generally composed of two five-man lineups, a first and a second team, comprising a total of 10 roster spots. Voting is conducted by a panel of 123 writers and broadcasters. Prior to the 2013–14 NBA season, voting was performed by the NBA head coaches, who were restricted from voting for players on their own team. The players each receive two points for each first team vote and one point for each second team vote. The top five players with the highest point total make the first team, with the next five making the second team. In the case of a tie at the fifth position of either team, the roster is expanded. If the first team consists of six players due to a tie, the second team will still consist of five players with the potential for more expansion in the event of additional ties. Ties have occurred several times, most recently in 2013 when Tyson Chandler and Joakim Noah tied in votes received. Tim Duncan holds the record for the most total selections to the All-Defensive Team with 15. 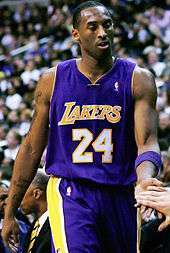 Kevin Garnett, and Kobe Bryant follow with twelve total honors each, and Kareem Abdul-Jabbar has eleven total selections. Michael Jordan, Gary Payton, Garnett, and Bryant share the record for most NBA All-Defensive first team selections with nine. Scottie Pippen, Bobby Jones, and Duncan made the first team eight times each. Walt Frazier and Dennis Rodman made the All-Defensive first team seven times. 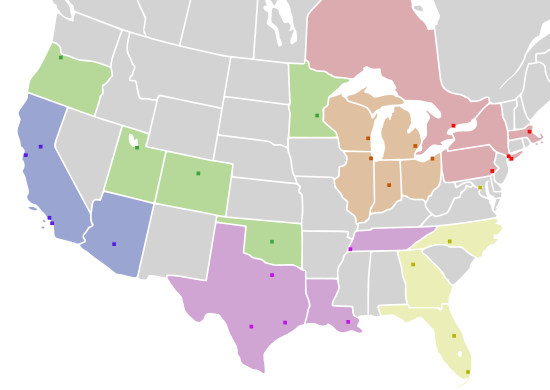 Ten players born outside the jurisdiction of the United States, plus two players born in U.S. insular areas (territories), have made either the first or second All-Defensive Team—Manute Bol, born in a part of Sudan that is now the independent nation of South Sudan; Hakeem Olajuwon of Nigeria; Patrick Ewing of Jamaica; Dikembe Mutombo of the Democratic Republic of the Congo; Andrei Kirilenko, born in the portion of the former Soviet Union that is now Russia; Anderson Varejão of Brazil; Thabo Sefolosha of Switzerland; Duncan and Raja Bell of the U.S. Virgin Islands; Luol Deng, a naturalized citizen of the United Kingdom born in what is now South Sudan; Serge Ibaka, born in the Republic of the Congo and naturalized in Spain; and Marc Gasol, born and primarily raised in Spain. Ewing, Olajuwon, and Kirilenko are naturalized U.S. citizens, and Duncan and Bell are U.S. citizens by birth, but they are still considered international players by the NBA because they were not born in one of the fifty states or Washington, D.C. When the coaches were responsible for voting, there were occasionally inconsistencies between the All-Defensive Team and the NBA Defensive Player of the Year Award, which has been voted on by the media. On four occasions, the Defensive Player of the Year winner was not voted to the All-Defensive first team in the same year. Player of the Year winners Alvin Robertson in 1986, Dikembe Mutombo (1995), Tyson Chandler (2012), Marc Gasol (2013) were instead named to the second team. 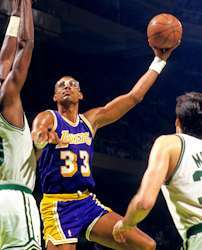 Kareem Abdul-Jabbar, formerly known as Lew Alcindor, has been on 11 All-Defensive teams. Walt Frazier is the only player to have been on all of the first seven All-Defensive first teams. Patrick Ewing is the only Jamaican-born player to have been on an All-Defensive team. 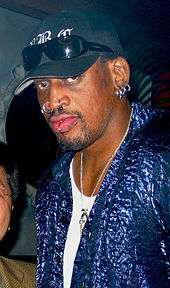 Dennis Rodman has been on the All-Defensive first team seven times. Scottie Pippen has made the All-Defensive first team eight consecutive times, from 1991–92 to 1998–99. 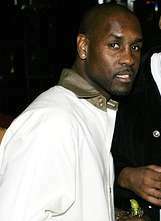 Gary Payton has the record for the most NBA All-Defensive first team selections consecutively, with nine, from 1993–94 to 2001–02. 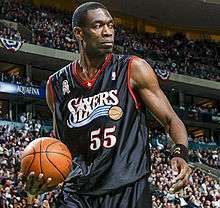 Dikembe Mutombo, who has won four NBA Defensive Player of the Year Awards, has been selected into the All-Defensive first and second team three times each. 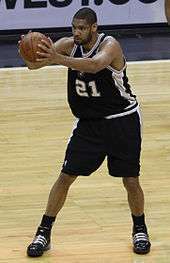 Tim Duncan is the only player with fifteen selections, and is the all-time record holder for most All-Defensive team selections. Kobe Bryant has made a total of 12 All-Defensive teams, more than any other guard. Ben Wallace, who has won four NBA Defensive Player of the Year Awards in five years, has been selected into the All-Defensive first team five times in six selections. The following table only lists players with at least four First Team selections. Certificate presented to Bobby Jones for All-Defensive honors in 1981–82. a The Defensive Player of the Year award was first established in 1983.
b Sanders has been inducted to the Naismith Hall as a contributor. c Sloan has been inducted to the Naismith Hall as a coach. d Before the 1971–72 season, Lew Alcindor changed his name to Kareem Abdul-Jabbar. e When Olajuwon arrived in the United States, the University of Houston incorrectly spelled his first name "Akeem". He used that spelling until March 9, 1991, when he announced that he would add an H.
f Ron Artest changed his name into Metta World Peace on September 16, 2011. "All-Defensive Teams". NBA.com. Turner Sports Interactive, Inc. Retrieved July 18, 2008. "All-Defensive Teams". basketball-reference.com. Retrieved July 18, 2008. ↑ "Top defender Noah highlights 2014 All-Defensive Team". NBA.com (Press release). NBA Media Ventures. June 2, 2014. Archived from the original on March 16, 2015. 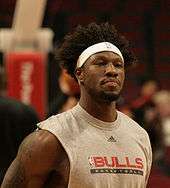 ↑ "Ben Wallace Tops 2005–06 NBA All-Defensive Team Selections". NBA.com. Turner Sports Interactive, Inc. May 11, 2006. Retrieved January 17, 2007. 1 2 "All-Defensive Selections by Player". basketball-reference.com. Retrieved July 18, 2008. ↑ "Bargnani becomes first European top NBA draft pick". People's Daily Online. June 29, 2006. Retrieved June 16, 2008. ↑ Begley, Ian (May 23, 2012). "Tyson named to all-defensive second team". ESPN.com. Archived from the original on March 12, 2013. ↑ "Kareem Abdul-Jabbar Bio". NBA.com. Turner Sports Interactive, Inc. Retrieved August 4, 2008. ↑ "Hakeem Olajuwon Bio: 1992–93". NBA.com. Turner Sports Interactive, Inc. Retrieved June 15, 2008. ↑ Dufresne, Chris (March 11, 1991). "Hakeem Still Can Be Called 'the Dream'". Los Angeles Times. p. 2.